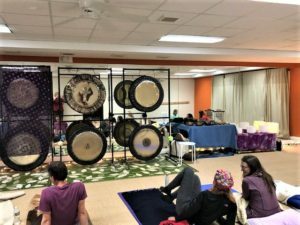 Join Gongmaster Joy and Drumsinger A.Michelle at this lovely yoga center on the Cape for a gong event in which you may come into a state of deep peace, profound relaxation and spontaneous healing as you absorb the harmonious resonance of the gongs, singing bowls, drums and other sound healing instruments! Leave with greater clarity, inner peace, and a connection to your inner truth and joy! Please call Bikram Yoga ahead of time at 508-540-0089 or go to www.bikramyogafalmouth.com to pre-register with a credit card. Bring a mat/pillow/blanket or whatever you need to be comfortable lying on the floor, or a folding lounge chair if you’d prefer to sit!